Silly Bee's Chickadees: Get Ready! I'm planning on broadcasting the tutorials for this layout next week on periscope while I'm on Christmas vacation- date and time tbd. I'll be recreating this design style on the back inside cover end papers, but don't feel that you need to have a journaling Bible to participate. You can work in a hymnal, a blank journal, or even on a separate piece of card stock to hang on your gallery wall! The tutorials will be in two parts. One for the background and one for the embellishments and both will be uploaded to my blog afterward. The materials list will be posted in a few days if you'd like to follow along and create with me! 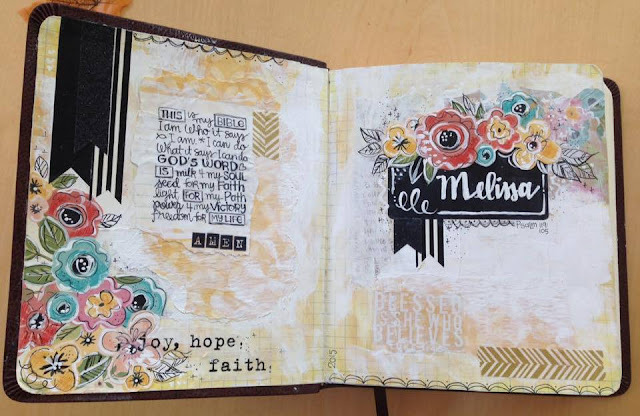 Mini Bible Journaling Periscope Giveaway!